The Velovations Bicycle Design Enterprise is dedicated to collaborating with the bicycle industry to develop new products and new processes. The goal of Velovations is to educate students in the fundamentals of a product development enterprise from customer need, through product and process design and testing, manufacturing, supply chain management, marketing, and distribution. To this end, Velovations is an industry directed, faculty advised student enterprise where faculty support students with critical learning modules that span the spectrum of engineering, business, science, and technology to enable their success in Velovations and prepare them for a future in industry. 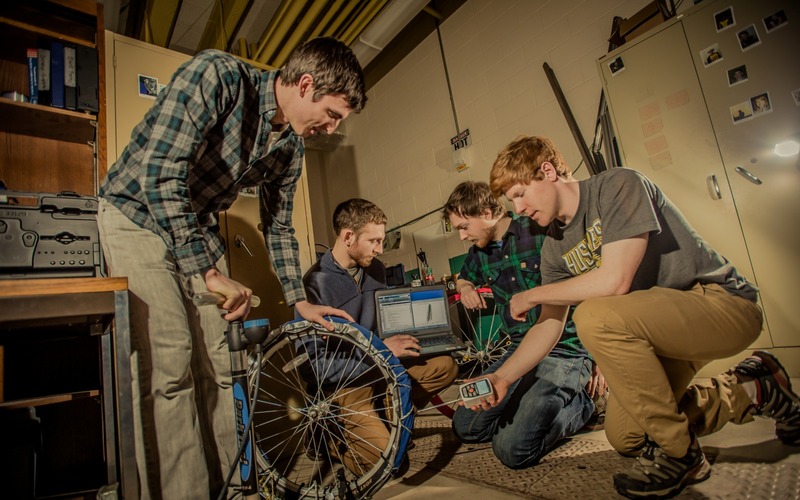 Students will use their diverse backgrounds in Engineering (Mechanical, Electrical, Industrial, Biomedical, etc.) and various other majors and concentrations (Sports Phys, Business Administration, Marketing, Technology, Technical Writing, etc.) to lead Velovations in delivering product and process innovations to the bicycle industry in the forms of hardware, analysis, and testing results. Velovations is open to students of all majors and areas of interest. Students don’t have to be avid cyclists to contribute to Velovations. Our name is taken from the French word for ‘bike’ – velo and our passion for innovation: Velovations.